Men’s Pick Up Soccer at The Mill Works! 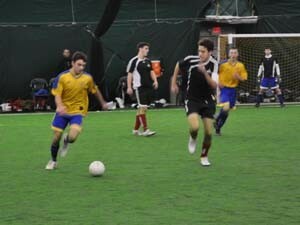 Westford Private Group: Sunday mornings from 7:15am – 8:45am for pick-up soccer: Indoor turf; no walls. Call today to set up your own group or to get on our e-mail list for other Pick Up opportunities! 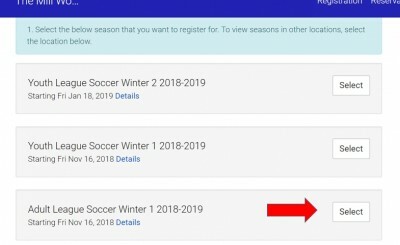 Join us November through March at The Mill Works for soccer leagues for all ages! Session 1 begins November 16th and runs through February 13th, while Session 2 begins January 18 and ends March 17. Register early and receive a free practice slot prior to the start of the season! All games are 7v7 play, no boards! Registering a team can be done in two easy steps. Visit the create a team page. If you have an account, login. If you don’t have an account, please register. Once you register you will be taken to the create a team page. Use the screenshots below once your account is created. 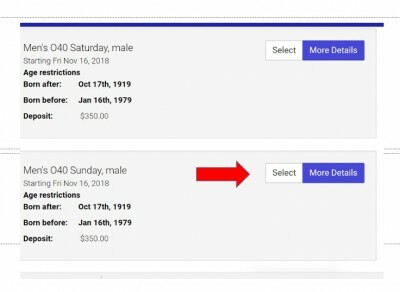 From there, select the appropriate gender/age group.